In the pantheon of Philadelphia Flyers disasters and embarrassments, the signing and subsequent buying out of goaltender Ilya Bryzgalov will have an honored place at the alter. It’s the perfect storm of blunder: a 9-year, $51-million financial disaster, a complete misjudging of character and another tombstone in the goaltending graveyard that’s haunted this team since Ron Hextall’s (first) tenure ended. Bryzgalov was originally signed to a nine-year, $51 million contract prior to the start of the 2011-12 season. He never lived up to the value of that contract and after two tumultuous seasons with the team, is on the open market. The Flyers will have to pay Bryzgalov two-thirds of the balance owed on his remaining term, or $23 million, but will have twice as long to pay it off. As such, the Flyers will pay Bryzgalov approximately $1.643 million per year for the next 14 years to not play for them. 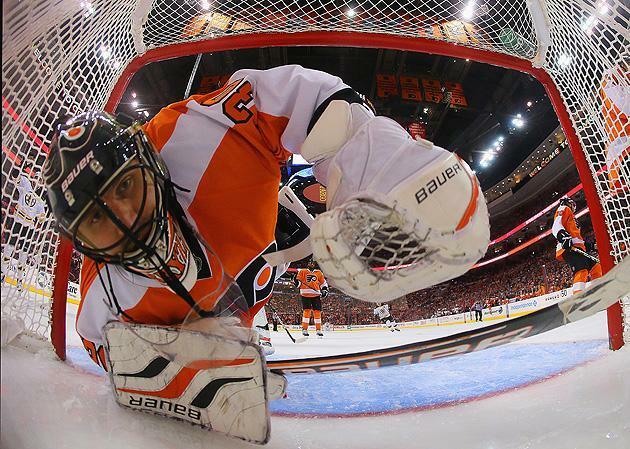 Yes, that’s right: The Flyers are going to pay Ilya Bryzgalov $23 million not to work for them. Take a bow, Ed Snider. You’ve made the Islanders’ Alexei Yashin buyout look chintzy by comparison. It’s impossible not to like Bryzgalov after he became the NHL’s most hilarious Cosmonaut, spouting off stream-of-conscious press conference non-sequiturs and becoming the breakout stat of HBO’s “24/7” season featuring the Flyers and Rangers. But it was a bad fit. From the start. Not only because Bryzgalov was the product of a goaltending coach and Dave Tippett’s system with the Phoenix Coyotes, and hence not worth the 9 years and $51 million bestowed upon him, but because giving him that contract was establishing a bar he could never reach, and that few goalies could. It's the Drury/Gomez Theorem, Bryzgalov edition. Remember what Ed Snider said when they traded for Bryz in 2011? He’s right: It is. It always has been since around 1987. But Snider, of all people, should know how these things turn out. Giving a goalie a 9-year contract in Philadelphia is like hiring Lindsay Lohan to star in your movie and then putting her trailer next to a liquor store – at some point, the wagon’s careening off the trail and the star’s out of the picture. He was set up to fail, and fail he did. His coach hated him. His teammates didn’t care for him. He feuded with the media. At no point during his tenure with the Flyers did he resemble a goaltender that made you believe he could backstop a Cup champion. For me, the end came in the days leading up to the Winter Classic. You remember, when Bryzgalov – 9 years, $51 million contract Bryzgalov – didn’t play in the NHL’s signature event because his team didn’t think he could handle the spotlight. After that, there was the playoff struggles and the alleged meeting nap and the debates about buyouts until the actual buyout arrived. He had to go. And now he’s gone. All of this ragging on the utter disaster that was Bryzgalov in Philly does overshadow the fact that the Flyers have bitten the bullet and decided to dramatically reduce their cap spending. According to SanFillippo, buying out Briere and Bryzgalov saves the Flyers “$12.17 million against the cap” in each of the next two seasons. That’s a lot of scratch, and they’ve already utilized some of it on Mark Streit; will a big ticket goaltender follow? Look, let’s be real: Luongo’s the play. The Canucks don’t have the bargaining high ground, and the Flyers have a multitude of young assets that can get a trade done. More importantly Luongo is something Bryzgalov most certainly was not, which is battle tested: Nothing he sees in Philadelphia, from playoff pressure to media scrutiny, is going to eclipse what he experienced in Vancouver. He has all of Bryzgalov’s whimsy, none of his weirdness and more experience in the crosshairs. And now the Flyers might be able to afford him.